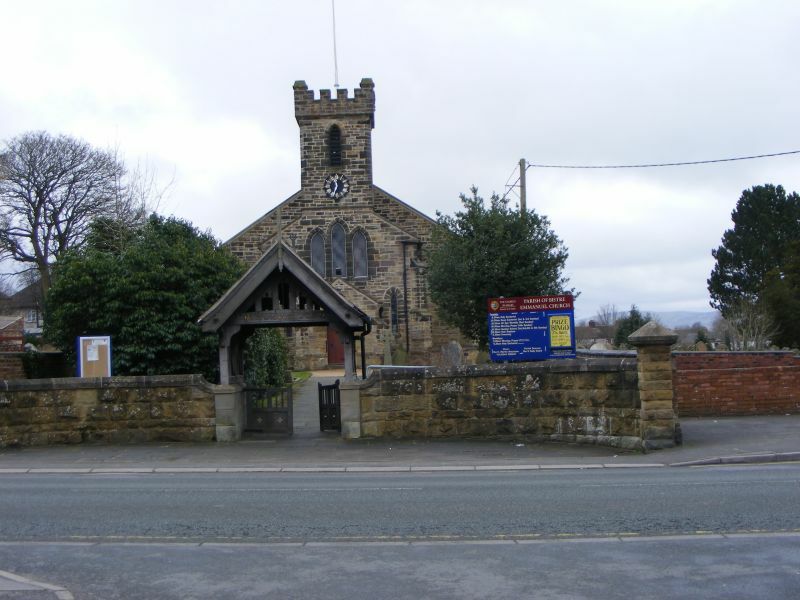 Location: Situated in a churchyard off the S side of Mold Road in Bistre. A grant of £250 was paid towards the construction of the church in 1839 by the Incorporated Society for the Building of Churches. It was designed by John Lloyd and opened in 1842. In 1881 W H Spaull remodelled the building; the W gallery was removed and the chancel was added. A simple vestry was built at the SE end in 1935. Gothic Revival style with Early English windows. Coursed dressed stone, slate roof, stone plinth. Aisleless with W tower and narrower shallow chancel. The squat castellated tower has arched louvred bell-openings. There is a triple lancet window on the W face and a gabled central porch flanked by narrow lancets. The nave has simple lancet windows alternating with stepped buttresses. The E elevation has blocked lancet windows flanking a shallow chancel with a triple lancet window. On the N side nave and chancel have stepped angle buttresses at the corners, on the S side a flat-roofed vestry is attached. The entrance leads to a vestibule with steps up to the tower on the N side. C20 doors lead to the body of the church which has an exposed timber roof, steps up to the chancel with an open arcaded pitch-pine screen, and steps up to the sanctuary. The E window is enriched with shafts with moulded caps. On the N side of the chancel is an organ, and in front of this a circular stone pulpit with cusped quatrefoil decoration and stone steps. At the SW end is a simple octagonal font with a cover surmounted by elaborate brass cresting. There are pitch-pine pews with simple floral decoration, some have brass plates with numbers. Stained glass includes windows by Ballantine, 1881; Jones & Willis 1912; A E Child, 1932 and T M Cox, 1950s. Listed as a good example of an early Victorian church which retains interior features of quality and interest. Facing south and reached off the main road west of the common. Situated close to the centre of Buckley, approximately 300m east of the crossroads between the A 549 and the B 5127. Situated at the entrance to a churchyard on the E side of Church Road in the NE part of Buckley. Situated in a churchyard off the E side of Church Road in the NE part of Buckley. Situated c1.7km SW of Mynydd Isa and reached from a by-road running N from the A5118 at Llong. Situated close to the junction of the B5444 and the A5118 at Llong, crossing the River Alyn. Situated c1.7km S of Mynydd Isa and reached from a drive running N from the A5118 at Llong.